Ex-Liberian President Charles Taylor ordered militias to eat the flesh of their enemies, a former death squad leader has told his war crimes trial. Joseph "Zigzag" Marzah said Mr Taylor had instructed his fighters in Liberia to even eat UN peacekeepers to "set an example for the people to be afraid". 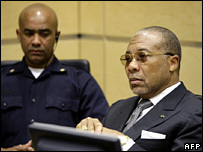 Mr Taylor is on trial at The Hague for backing rebels in Sierra Leone in an 11-year war in which thousands died. He has denied the 11 charges of crimes against humanity and war crimes. The trial at the UN-backed Special Court for Sierra Leone has been moved away from West Africa because of fears that it could lead to renewed instability in the region. It began last June, but was adjourned until January after only one day when Mr Taylor dismissed his lawyer. Many witnesses have since testified behind closed doors. Mr Marzah, a key prosecution witness, agreed to appear in open court only after lengthy negotiations over the protection provided for him and his family. Describing himself as Mr Taylor's former chief of operations and commander of a death squad in Liberia and Sierra Leone, Mr Marzah said the former leader ordered militias to eat the flesh of enemies in Liberia, including African and UN peacekeepers. "He said we should eat them. Even the UN white people - he said we could use them as pork to eat," Mr Marzah said, adding that it was to "set an example for the people to be afraid". He said repeatedly that nothing was done without an explicit order from Mr Taylor and that anyone who violated his commands would be executed. Mr Marzah then recalled how the victims of the cannibalism were usually members of the Krahn tribe of Liberia's former president, Samuel Doe, who was in power in 1989 when Mr Taylor started the country's six-year civil war. However, he said they had also included troops from the West African Ecomog peacekeeping force, which was deployed in 1990, and some UN peacekeepers. The international peacekeepers eventually helped stabilise Liberia, leading to a peace agreement in 1995 and a presidential election two years later that Mr Taylor won. "We ate a few [Ecomog soldiers], but not many. But many were executed, about 68," Mr Marzah said. When asked by defence lawyer Courtenay Griffith about how the militiamen would "prepare a human being" for eating, Mr Marzah described the splitting, cleaning, decapitating and cooking of the corpse with salt and pepper. "We slit your throat, butcher you... throw away the head, take the flesh and put it in a pot... Charles Taylor knows that," he added. Mr Marzah also described how he had killed so many men, women and children that he had lost count, and also slit open the stomachs of pregnant women on Mr Taylor's orders. Earlier in his testimony, Mr Marzah told the court he had taken weapons, some stored at Mr Taylor's presidential mansion, to Sierra Leone and returned to Liberia with diamonds which he then delivered to Mr Taylor. Mr Taylor is accused of funding Sierra Leone's former rebels, the Revolutionary United Front, by selling diamonds on their behalf and buying weapons for them. 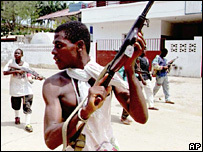 The RUF became notorious for hacking off the hands and legs of civilians during their armed rebellion in Sierra Leone from 1991 to 2002.